SAN DIEGO (KGTV) - Adobe Bluffs Elementary School in Rancho Peñasquitos is using foreign language as a tool to prepare children for careers of the future. 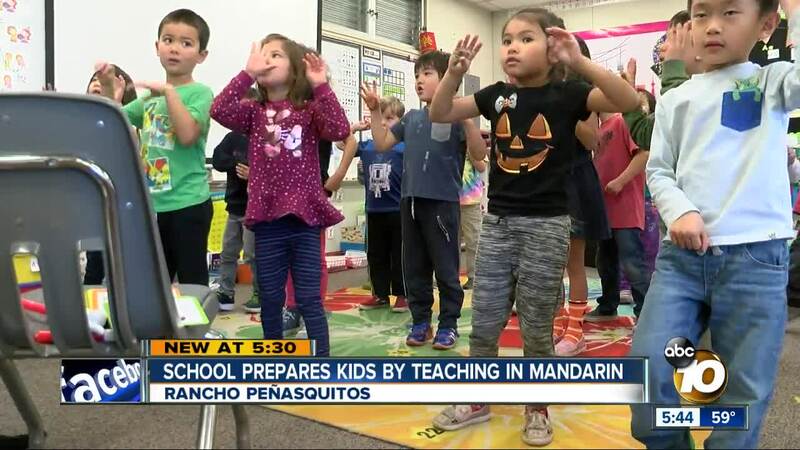 Monday, 10News visited the school's Mandarin immersion program. The class consists of 26 students, half of which are native Mandarin speakers. Half of the school day is taught in Mandarin, including subjects such as math, science, and social studies. "Our school district is very forward thinking. We think ahead and make sure our mission is accomplished for them to be career ready," said Principal Eddie Park. While the immersion program is optional, all students at Adobe Bluffs take Mandarin classes. Weekly lessons are also offered to parents, to help them understand what the children are being taught and to allow them to help at home. Park says about 200 families were on the waiting list to get into the immersion program for the 2018-2019 school year.